I love nature--there is a prairie preserve close to my house that I love to hike. I try to take pictures whenever I can. The prairie fascinates me. Did you know that the grass has an incredible root system. Because of that root system, it can survive droughts, floods, and even fire. The native american used fire as a tool for hunting buffalo herds. Also, There were, of course, the natural occurrence of fire from lightning. And year after year the prairie would continue to grow. The ash from the fires created some of the most fertile soil in the world. For national poetry month, I wrote a haiku. Five, Seven, Five syllables--mostly about nature--and included some pictures. 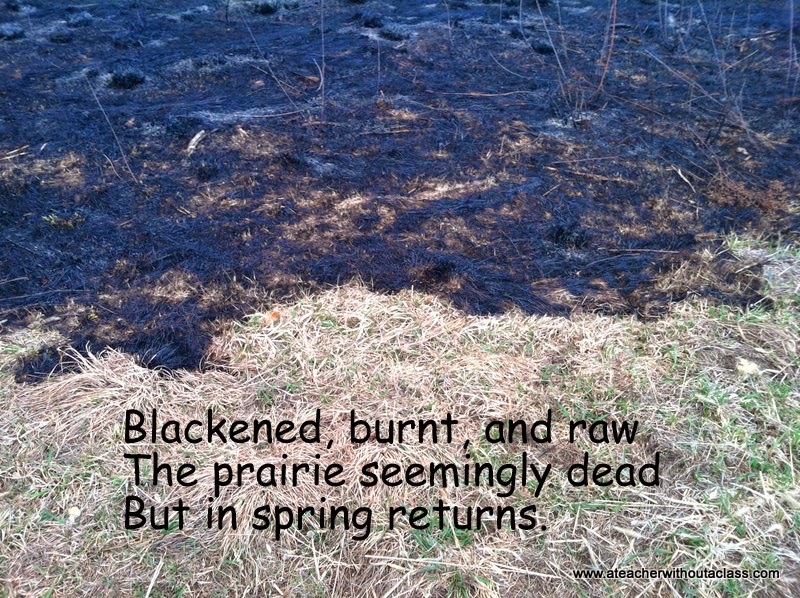 Today, there still may be fires from lightning, but they do controlled burns to maintain a healthy prairie ecosystem. Lovely haiku--a metaphor for hope. Thank you for sharing it. Great poem and pics! What a beautiful thought...especially at Easter time!